ЯДЕРНА ЕНЕРГЕТИКА ТА ДОВКІЛЛЯ 2 вип. New composite fibers are synthesized by in situ deposition of potassium-nickel ferrocyanide layer on the surface of modified polyacrylonitrile fibers. The data of electron microscopic and infrared investigations confirmed the formation of the ferrocyanide layer on the fibers’ surface. Composite fibers are chemically stable in both acidic and alkaline solutions, and are characterized by high selectivity for cesium ions in the presence of excess of competitive sodium and potassium ions. The influence of the magnetic isotope effect on the reaction of radical pairs containing radical-ion UO2 2+ is investigated. This can be further used in the new method of uranium isotope separation in chemical reactions. This study considers the main tasks of comprehensive radiological monitoring in the areas of NPP location. 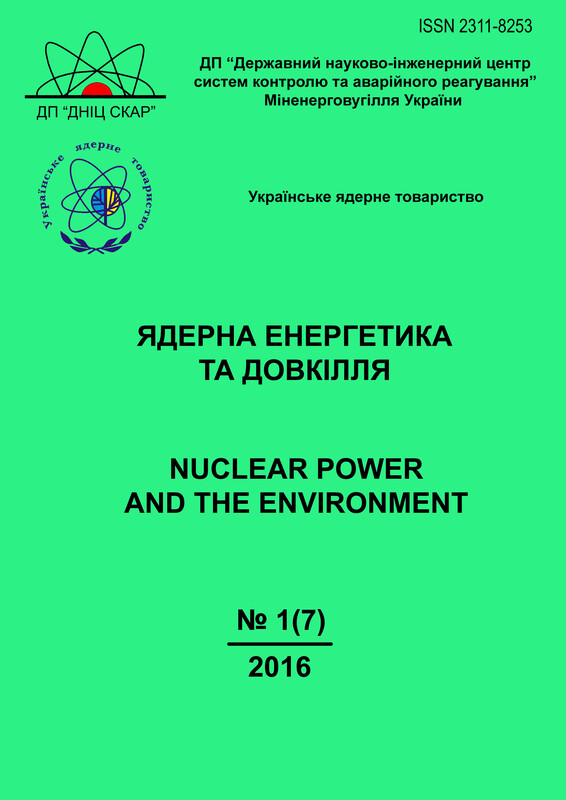 It is shown that in order to transform an informational monitoring system into a management system, i. e. to expand its functionality it is necessary to incorporate an analytical expert subsystem in it to assess impact of a nuclear power plant on the environment (EkoIES), which is designed to collect, preserve, organize, analyze, share and map the data of comprehensive radiological monitoring / control in the monitoring areas of nuclear power plants. 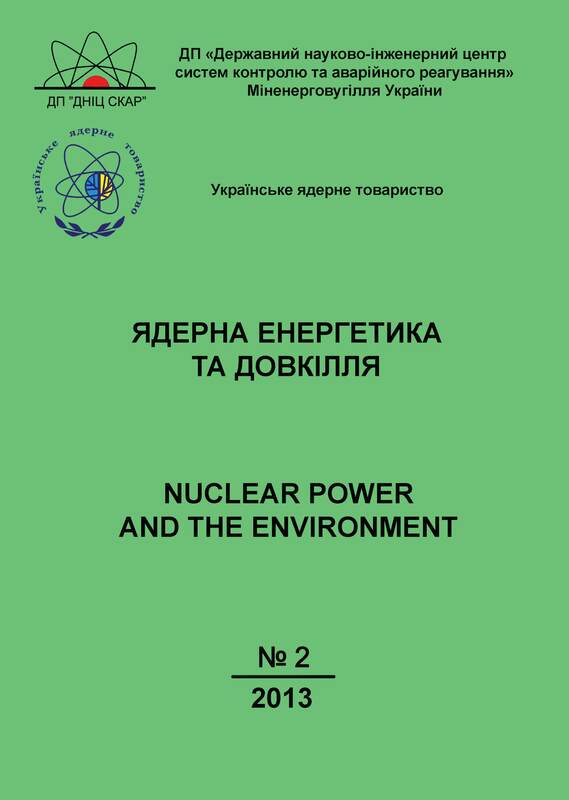 Ukrainian NPPs have accumulated in total more than 33 thousands m 3 of liquid radioactive wastes (LRW) of different activity categories. The known methods of processing the sediments from LRW temporary storage containers cannot be widely applied because of their low technological and economic efficiency, as well as due to lack of storage facilities for the final product, which has a larger volume in comparison to the initial LRW. It is proposed to separate components of preliminary purified LRW, and then to process them by periodic portioned filtering through a layer of fine-dispersed adsorbent in the flow of the circulating eluent. This method permits to reduce significantly the amount of radioactive wastes and to extract valuable non-radioactive components in a purified form. Chemical composition and properties of lava-like fuel-containing masses from the ―Shelter‖ (LFCM) are considered. It is noted the necessity of further LFCM conditioning to ensure the safety of their prolonged storage and disposal in a geological repository. As an optimal method of conditioning it is suggested the joint vitrification of LFCM and of liquid boron-containing radioactive waste from VVER NPP using an induction ―cold crucible‖ melter. The results of the qualification of main steam isolation valves (MSIV) for water / steam-water medium have been analyzed taking into consideration the ―small series‖ WWER-1000 units. This analysis demonstrates that qualification of MSIV for water has not been substantiated sufficiently for the ―small series‖ of WWER-1000, so it could not been extended for serial WWER-1000. In addition, it is necessary to perform the qualification of MSIV for water for severe beyond design basis accidents taking into consideration possible human errors and multiple failures based on reasonably substantiated criteria of qualification.